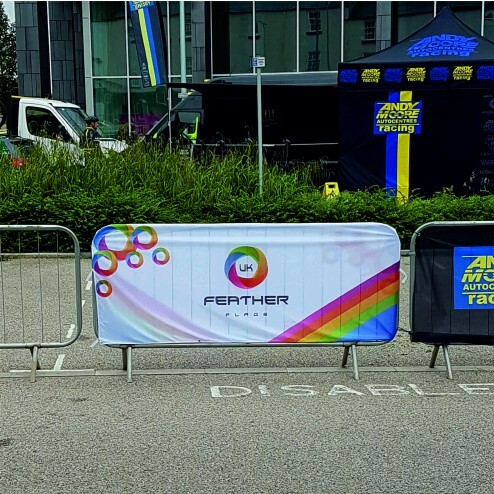 Our tough and durable Barrier Jackets are the perfect way to subliminally advertise whatever you need to, whilst disguising those ugly barriers. The clever mesh material that our Barrier Jackets are constructed from prevents that barrier from being a wind block whilst being lightweight yet strong. They are also machine washable which saves on dry cleaning costs. Our printing technique, which can give you text, art or photos, involves dye sublimation which ensures that your Barrier Jackets will be water resistant and stay vibrant for years to come. These easily mounted Barrier Jackets are perfect for a wide array of uses, including; Building sites, promoting bands or charities, advertising your business or festival and even letting people know where the bar is, to name but a few! All you have to do is slip them over the barrier and affix the Velcro on the smaller options, or use the cleverly place eyelets on larger sizes. As soon as you have decided upon the perfect style an design for your Barrier Jackets you are ready to contact one of our team here at uk-featherflags.co.uk. Don’t forget that we have an incredible design team who can assist you with your artwork, we have an array of delivery options to suit you even if you are short of time and there is always one of our professional printers waiting at the end of the line to answer any questions that you may have.